For those of you who remember my jubilation last summer when I’d discovered that my struggling teeny black current shrub had miraculously birthed an over-flowing pound of ripe juicy berries, you’ll understand me being tickled beyond pink when this year I picked two pounds! With two pounds, I can make my own black current jelly or so I thought. Usually I’m pretty good at eyeballing volumes. I was dead sure that my two pounds would measure out the nine cups needed to make a batch of jelly. Ha! I was four cups short. What to do? Easy. I added four cups of raspberries. How lovely I thought, ‘cassis e framboise confiture’. So I boiled up the fruit with a little water, tied it in cheesecloth, hung it to drip and watched… Look closely at the shot above. See how little juice is actually dripping from that bag. I needed five cups of berry juice to make the jelly. No matter how long that bag hung, I wasn’t getting anywhere near five cups. There was no way that I was going to waste those currents so I switched gears, turned right and made jam. Makes about 4 x 500 ml jars. 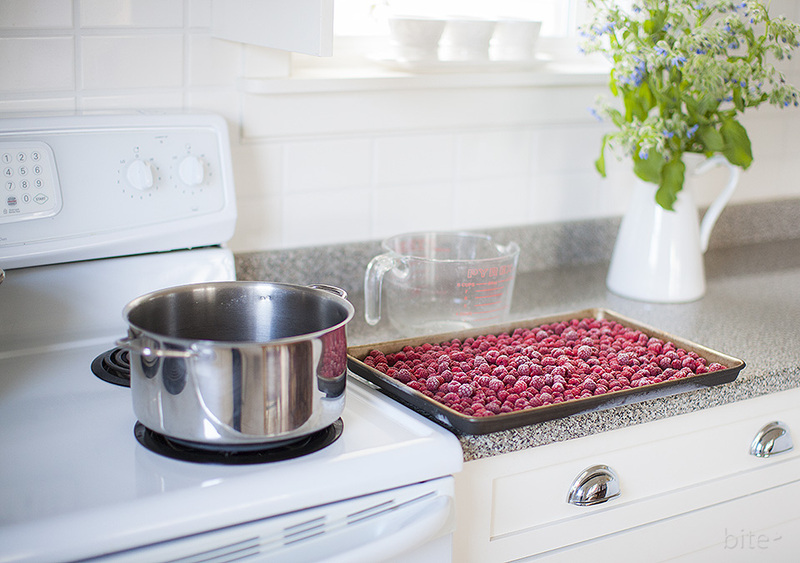 Wash, remove stems and place berries into a stainless steel pot. Reduce heat, cover and simmer 15 minutes; using a potato masher, crush occasionally. Prepare mason jars and lids according to manufacturer’s instructions. Keep jars and lids hot until ready to use. After 15 minutes, stir in all the sugar. Increase heat to high heat and bring mixture to a full rolling boil that you can’t stir down. Remove from heat and stir and skim off any foam for 5 minutes. Pour jam into hot jars to within ¼ inch of top of jar. Place lids and screw bands on jars until fingertip tight. After cooling check jar seals. Sealed discs curve downward and do not move when pressed. Label and store jars in a cool, dark place. THE LOVE: It’s super important to leave space in your canning jars between the top of the food or liquid and the underside of the lid to allow for food expansion as the jars are heated and for the formation of a strong vacuum seal as your jars cool. A quarter inch is a good rule of thumb. Also, if you have a bit extra jam but not enough to fill a jar pour it in a sterilized jar, but after it’s cool keep it in the fridge. This entry was posted in fruit, preserves/jams/jellies and tagged black currents, farm, fruit, jam, Raspberries by Michelle. Bookmark the permalink.